You are here: Home / Buy It / P90X – The Xtreme Home Workout! P90X – The Xtreme Home Workout! If you don’t want to buy home gym equipment, and you don’t want to go to the gym then what do you do? 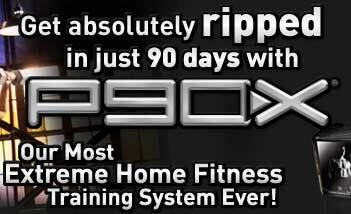 For great results at home try P90X! This amazing home workout is worth the cost and is guaranteed to give you fast results that everyone will be sure to notice! The workout is split into different body parts. This means that each day you will do different exercises for different parts of your body. On the days in between lifting you do cardio routines that consist of kickboxing (Kenpo X), Cardio X, as well as a plymoetric workout. This well rounded workout routine will keep your body from hitting the evil plateau. Tony Horten calls these varying workout routines “muscle confusion”. This muscle confusion is used every day by trainers to keep their clients body changing. The only draw back to this home-workout routine is that it is slightly advanced. However, if you can’t do pull ups with the aid of a chair and a chin-up bar (which mounts inside a door frame), they do show you how to do the lesser version with a resistance band. The program does require at least one hour a day. However, 1 hour out of 24 isn’t that much when you really think about it. The only equipment needed for this workout is a chin-up bar and a set of weights. I recommend buying the interchangeable weights from target. These weights are made by Reebok. They are 5 weights in one set. By simply changing the position of the peg you can change the weight. They make for an inexpensive set of home weights without all the extra clutter! You have several choices when choosing a chin up bar. You can either get the bar that mounts (by twisting) in the door frame OR you can get a bar that loops over the top of the door frame (this is the one I have). The chin up bar that loops over the top of the door frame is quick and easy. I myself have used P90X and love the variety of the exercises and the results I have gotten from the workout. If you do choose to buy this workout routine then REMEMBER to start slow. You don’t have to do 100 pushups on the first workout; you just have to “do your best and forget the rest.” The results really come from doing the routines consistantly…not by killing yourself in one workout. The program ends up being 3 payments of 39.95 and about 13 dollars for shipping. It should arrive with in 5 -7 days. The program also comes with an eating guide and stretching routine. 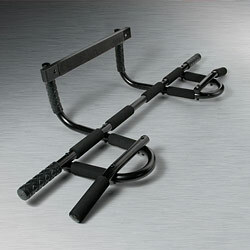 For great deals on pull up bars, yoga blocks, and other P90 workout equipment vitsit the Fit Tip Daily Store! If you’re looking for a great body in little time, without leaving your home, then this is the routine for you! I promise if you do the workouts you will see results fast, no matter what size or condition you are in!